John Barker looks at the lives of TV’s most dysfunctional family as they crash into RTÉ. Dear Diary, today I robbed a truck load of meat… as you do! I also faked my own death to escape the debt collectors… as you do! Oh and I got stoned… as you do! Lots of love, the Gallaghers! Whatever about stealing the idea from the U.K., the U.S. adaptation of Shameless has finally arrived on Irish screens. Kicking off last Thursday on RTÉ, the Gallagher family came in force. With only a mere brief encounter with the U.K. series, I draw upon few comparisons when watching the show. The show brings us Frank, of the Gallaghers, who pours the love and devotion for his five kids into alcohol, drugs and animalistic antics. 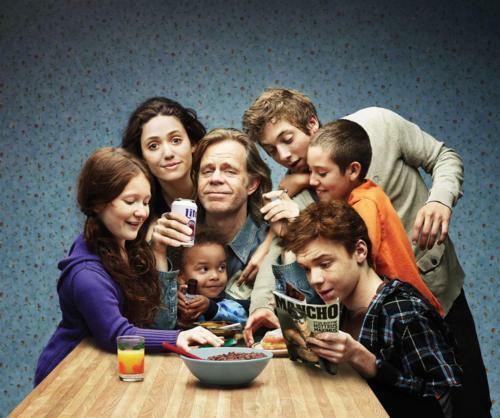 Played by William H. Macy, the character portrayal is spot on; an absolute lout whose entertainment value lies heavily in the fact that viewers are proud of how they turned out and proud of their functional families. Dysfunctional family is what it would seem that the Gallaghers represent and epitomise. However there is a certain sense of order amidst the chaos. Emmy Rossum takes on the role of Fiona, Frank’s eldest daughter, who is both the spine of the family and the show, excellently holding things together. Her romance with Steve (Justin Chatwin) adds a sense of glamour and escape from the eccentricity of family life. One thing that overrides the show is the love within the home and community. Indeed they behave wildly but with each episode we are left bathing in the sense of unity which spills out of the TV set. Whilst taking family troubles to the extreme it is something with which all the audience can relate. The show explores the family bonds and highlights the essence of what being a part of a family really is. As well as the internal, the show approaches issues of global recognition. The issue of homosexuality is to be explored in the coming series as Cameron Monaghan plays Ian, the teenager with a secret. Cover-ups and lies lead to a foray of unexpected and inevitable situations. An issue, even more so relevant to society today than when first exposed in 2004 with its British debut, is that concerning financial hardship. Families of all classes can relate to the necessity of money in order to simply make it from one day to the next. Although the Chicago bunch does not mirror the dire straits which the Manchester family found themselves in, the lingering desperation and struggle remains equally strong. With the British production having recently embarked on series 8, the longevity of the U.S. is yet to be established. The content for a compelling script is certainly there and has already firmly been established, however the show has met an unusual reception with opinions fluctuating weekly as aspects prove to push the boundaries a little too much for the audience overseas. No doubt the production has done justice to the original and as a newly established fan; I will not be missing any future episodes should the high standard remain at the same level. I can shamelessly say that I am hooked. A Gallagher at heart. Shameless continues on RTÉ 2, Thursdays at 9.55. ← A classic you say?